Sakura discovers that the missing books in Akiho-chan’s library are actually there, but invisible. She uses her staff to pull the Lucid Clear Card. She poses for pictures for Tomoyo before Akiho returns. 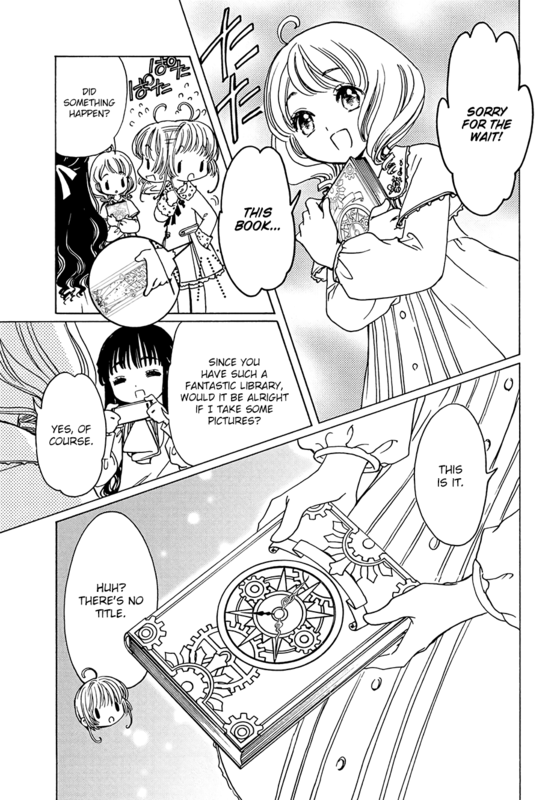 Akiho has a book with a cover of gears and a clock. She calls it Alice in the Land of Clocks. Sakura recognizes the clock, but can’t remember where. Although Akiho does not know what language the book is written in, she’s been taught to read it and can understand it. Sakura wants Akiho to tell her the story in the book. They are interrupted by a call from Akiho’s butler to serve them cold drinks. They leave the book on a table, where it glows. Sakura comes home where Touya realizes Sakura is involved in magical things again. Sakura goes to her room and hugs her teddy bear from Syaoran. The next Sunday, the hooded figure is apparently observing Sakura. Sakura takes her big bag to meet Syaoran for a picnic. Meanwhile, Kero is on a video call with Yue, informing him that Tomoyo convinced him not to follow Sakura. Sakura makes it to the meeting site early, only to find Syaoran waiting for her. The two walk to the Tomoeda Botanical Garden since Sakura has the tickets her dad gave her. Amidst the flowers of the garden, Sakura reveals her bento boxes of food she made. Syaoran tries the tamagoyaki (rolled omelette) and loves it. As they enjoy the time, a massive wind shows up. And so we come to Cardcaptor Sakura Clear Card Arc 12. Sakura gets a card and a date. That is all. 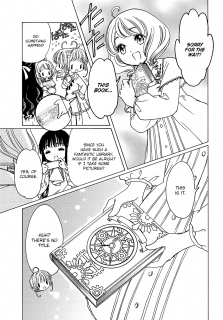 Naturally, we aren’t told the story of Alice in the Land of Clocks because no doubt, it would reveal plot stuff for this manga. We aren’t told what language the book is written in, only that Akiho can read and understand it to a degree. Why didn’t Sakura actually recognize the clockwork stuff on the cover of the book rather than say, “This seems familiar”? Thus far, things continue to point to Akiho either being the hooded figure stalking Sakura or tied in with the hooded figure. I’m thinking Akiho will be another magic girl. The incident in the library may have been a test for Sakura. We’ll see. 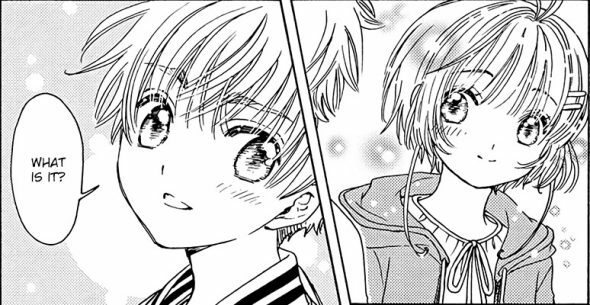 The highlight of the chapter is the rather cute date between Syaoran and Sakura. It amused me how Sakura really wanted to get there early. She did, only to find Syaoran already waiting for her. While all of the elements of the date were pretty cliched, they were still pretty cute and sweet. I enjoy the wholesomeness of their relationship and hope that CLAMP continues to develop it. Naturally, Sakura has to say, “It would be nice if this lasted forever.” Likely, we have another Clear Card that caused the wind to interrupt their date. I’m going to guess that the hooded figure will be somewhere nearby. So maybe we’ll see Syaoran and Sakura doing action together, especially since there’s no Tomoyo or Kero around. Time to wrap up the review of Cardcaptor Sakura Clear Card Arc 12. Did you know that CLAMP are the hiatus masters? No? Well, this series is taking a short time off (an issue or two) cause that’s CLAMP for ya. However, it should only be a month left as of the date of this post. Why doesn’t Touya say something to Sakura since he clearly sees that she’s involved in magic stuff again? In the end, there’s still not a whole lot from Cardcaptor Sakura Clear Card Arc 12 in terms of plot. However, the cute, sweet date of Syaoran and Sakura makes it a nice chapter. Well, I think she did recognize it, she just wasn’t sure whether it was a coincidence or not.